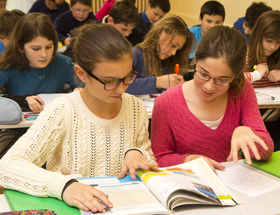 The Middle School marks the intermediate stage of Ermitage’s comprehensive international education, which provides a bilingual curriculum from Pre-K through Grade 12. Our international community welcomes children from all over the world to build on their achievements both in the classroom and beyond school walls. Some students have joined Ermitage recently but many have been with us since Maternelle (pre-K). All of our students present varied levels of experience and approaches to learning English. A curriculum based off of the French curriculum. Instruction in English integrated into the classroom. *For 9th grade (4ème) our students attend the Upper School to aid in the transition and preparation for their intended diploma track (Baccalauréat français, OIB, or IBDP). Similarly, students who prefer learning in English and want to pursue the IB Diploma, can begin in our International Studies Program beginning in 8th grade.